Do you feel excited every time when you hear about upcoming slot from Thunderkick? We hope so, and we have a good news a brand New Tiger rush video slot is on it’s way to all online casinos. Don’t overreact this time, as this slot looks more like a filler than a hit. Let’s take a closer look at its features and find out if can you win big on it. 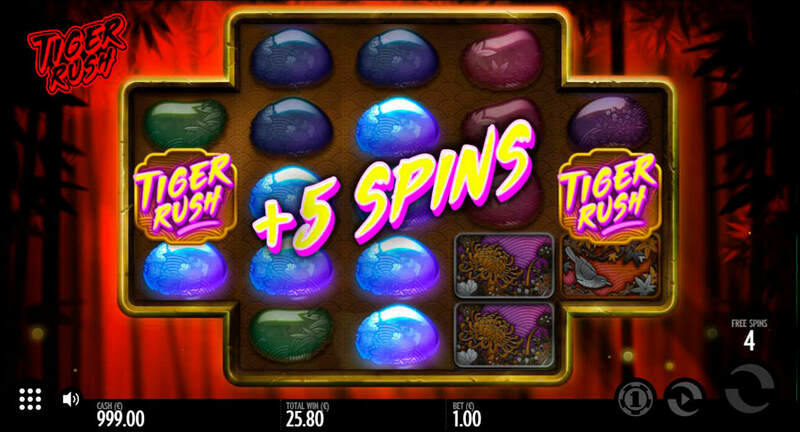 Read our Tiger Rush slot review. 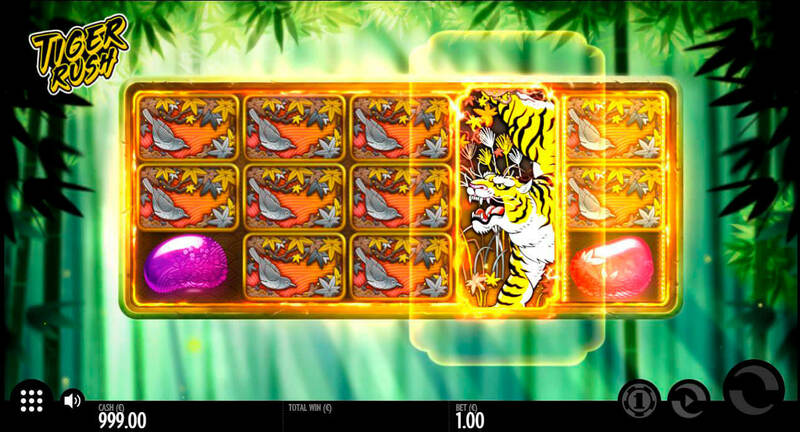 Tiger rush is a regular slot with ordinary 5 reels and 10 lines, so nothing new there. However, when it comes to the bonus game, I expand to 25 pay lines. This slot has some in-game features and of course bonus free spins. You can choose bets from minimum €0.10 up to huge €100 per single spin. There is a total of seven symbols you can hit, but what disappoints us is that only two of them are premium symbols with high payouts. If you hit five of a kind of top paying symbol with a bird on it, you can get only 15x bet. Full screen of top paying symbol give you 150x total stake in the base game and 375x win in free spins. So it’s all about how many times you can hit it during respins or free spins, and it doesn’t sound good. The main feature of the base game is a wild symbol. You can catch those symbols on any of three middle reels, it expands and gives you one extra spin. Yes, it looks like the same mechanic from a popular starburst slot. There are actually two ways to trigger free spins on this slot, first is to catch two scatters, second is to get 1 wild and one adjacent scatter. Sounds too easy, but you can get scatters on first and last reel only. In the bonus game, you get 5 free spins for two scatters, or 10 free spins, if you hit two, scatters and adjacent wild at the same time. You can retrigger it. If you catch two scatters once again while in the bonus mode and get another 5 extra spins. From our review, you can see that big win condition is when you hit free spins, you need a catch-all three middle wild reels and top paying symbol. Maximum win you can expect from this slot is 1783x your bet, which is not that big, comparing for example to many BTG slots. Nevertheless, this is the most that you can expect from the medium to low variance slot with a theoretical return to player 96.3%. You can expect to trigger many bonuses from this slot and most of them with a low winning, so the best winning strategy for this slot is to play with your bet. It’s good to try to do for example 1 euro spins and then switch to 5 euro spins for some time and try to hit the bonus. That’s the only way you can win big on this slot. We do believe that this slot is an excellent choice when it comes to bonus wagering and we suggest you try it especially when you if you use one of our exclusive 200% casino bonus. This slot helps you to wager faster and win big if you are lucky enough to hit three wild reels at a bigger bet. Let’s hope for some new high paying releases from Thunderkick by the end of the year, we all want to bee more excited about big wins and more complicated slots with better graphics extra features. Tiger slot looks too simple, nothing special there. Gameplay is not too complicated – it’s all about wild reels and respins, hit three of them and you are happy. Still seems like a good slot for wagering, however, don’t expect a lot of huge wins like on Pink elephants.